7/27 Cup of Coffee: Jalen Beeks (pictured) had another strong outing, while Mike Shawaryn finally cooled off in Salem. With Rafael Devers in the big leagues, Sam Travis and Michael Chavis are the two best offensive players in the Red Sox farm system, and they each had solid performances on Wednesday. Rusney Castillo and Jeremy Barfield led Pawtucket and Portland, respectively, and Tzu-Wei Lin continued to swing a hot bat. A six-run sixth inning and a great start from Jalen Beeks helped the PawSox easily defeat the Mud Hens. Beeks struck out eight and allowed only one run over his six innings as he continues to impress in Triple-A. Robby Scott followed with a scoreless inning, and he has given up only one hit in his four appearances since being optioned. Rusney Castillo extended his hitting streak to eight games as he went 3 for 5 with his 11th home run of the year. Tzu-Wei Lin and Sam Travis each went 2 for 4, and Lin now has multiple hits in three of his last four games. Jeremy Barfield drove in four runs to help lead the Sea Dogs past the Fisher Cats. His big hit was a three-run home run in the second inning, and he also added two singles and a sacrifice fly. The 29-year-old has been one of the best hitters in the system in July, slugging nine home runs in only 94 at-bats. Michael Chavis went 1 for 2 with two walks, and after striking out in over 25 percent of his at-bats in Salem, Chavis has cut that rate to just over 15 percent with Portland while still showing above-average power. 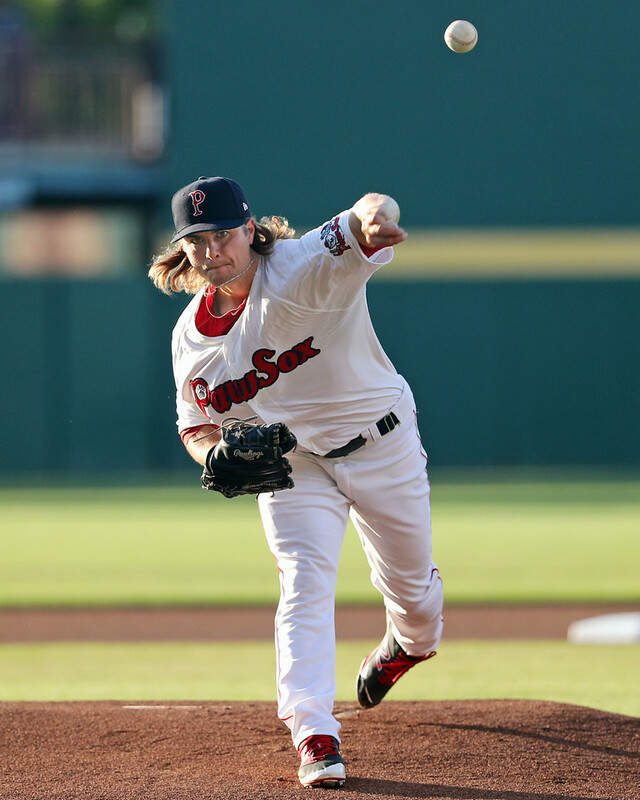 Henry Owens picked up the win after going five innings while allowing one run on three hits and three walks, and Jacob Dahlstrand followed with three shutout innings, striking out two. After entering the game with a 1.60 ERA and 41 strikeouts over his last 33 2/3 innings, Mike Shawaryn was roughed up by the Blue Rocks. The 22-year-old gave up five runs on six hits and four walks over 2 2/3 innings. Logan Boyd came on with the bases loaded and two outs in the fourth and he escaped the jam, and ultimately pitched 4 2/3 innings of two-run ball. Jose Sermo and Austin Rei each went 2 for 4, and Josh Ockimey went 0 for 4 with a strikeout as his 12-game on-base streak came to an end. Despite an impressive performance from the middle of the order, the Red Sox fell to the Rays. Everlouis Lozada led the way, driving in two runs and going 3 for 5 to raise his average to .286. Both Pedro Castellanos and Ricardo Cubillan went 2 for 5, with Castellanos adding a triple. Ritzi Mendoza took the loss after allowing two runs, one earned, over four innings, and Taylor Ahearn gave up three runs over four innings. Wednesday's game was rained out and will be made up as part of a doubleheader on Thursday. Player of the Night: While Jeremy Barfield made a very good case, Jalen Beeks gets the nod for his six innings of one-run ball with eight strikeouts. The 11th ranked prospect on SoxProspects.com has been on fire lately, allowing only five earned runs over his last 26 innings, walking seven and striking out 29. The 24-year-old lowered his ERA to 2.89 with Pawtucket, and he may push himself into the top-10 of the system after starting the year ranked 23rd.